Four gallons per hour per horsepower is the rule of thumb when calculating water used by a steam boiler, but 34.5 pounds of steam per hour per horsepower is more exact. These are both ways of determining how much make-up water goes into a steam boiler. The 34.5 pounds (15.65 kg) of steam is at a pressure and temperature of 0 psig (0 bar) and 212°F (100°C), with feedwater at 0 psig and 212°F. One boiler horsepower is about 33,475 BTU per hour (about 9,811 watts; 8,436 kcal/hr).1 Armed with this information, one can assume that a field estimate of a 100-horsepower boiler is 400 gallons (1.514 liters) of water use in one hour. Therefore, pretreatment is a water softener and/or RO to support boiler make-up flow of 6.67 gpm. Mission accomplished, but not so fast! In the world of boiler pretreatment, this is where the average water conditioning knowledge base ends. For pretreatment in the industrial and manufacturing realm, this is merely the beginning. For the sake of time, this article will focus on two key metrics: calculating boiler make-up and the importance of steam purity. When one takes a step back and evaluates boiler cycle calculations, it is easy to understand the ever-increasing popularity of solids-reducing technologies (i.e., nanofiltration, reverse osmosis). Any decrease in feedwater conductivity increases boiler cycles. (Note: There are limits to the optimal amount of cycles, with 100 being the theoretical maximum.) The higher the boiler cycles, the lower the blow-down percentage. Blow-down reduction often results in significant energy/fuel savings and total water use. Example: If a boiler is operating at 10 cycles, the percentage blowdown is 10%. Through proper boiler calculations and an understanding of steam use in a customer’s process, one will be better prepared to accurately size equipment and make recommendations that meet a desired water quality specification. Boilers need make-up water to replace steam generated and the water blown down to waste. Specific conductance (conductivity) setpoints commonly control boilers. The conductivity control setpoint is primarily based on the pressure rating (psi) of the boiler. Conductivity is a measure of water’s ability to transfer (conduct) electric current (see Table 1).2,3 As the boiler conductivity increases, so too does the concentration of suspended and dissolved solids. In order to regulate the conductivity setpoint and maintain operational stability of the boiler, blowdown is essential. The objective is to control the cycles of concentration (accumulation of impurities). A boiler cycle is the number of times TDS present in feedwater can concentrate. For example, 100 TDS feedwater, cycled five times, would result in 500 TDS. 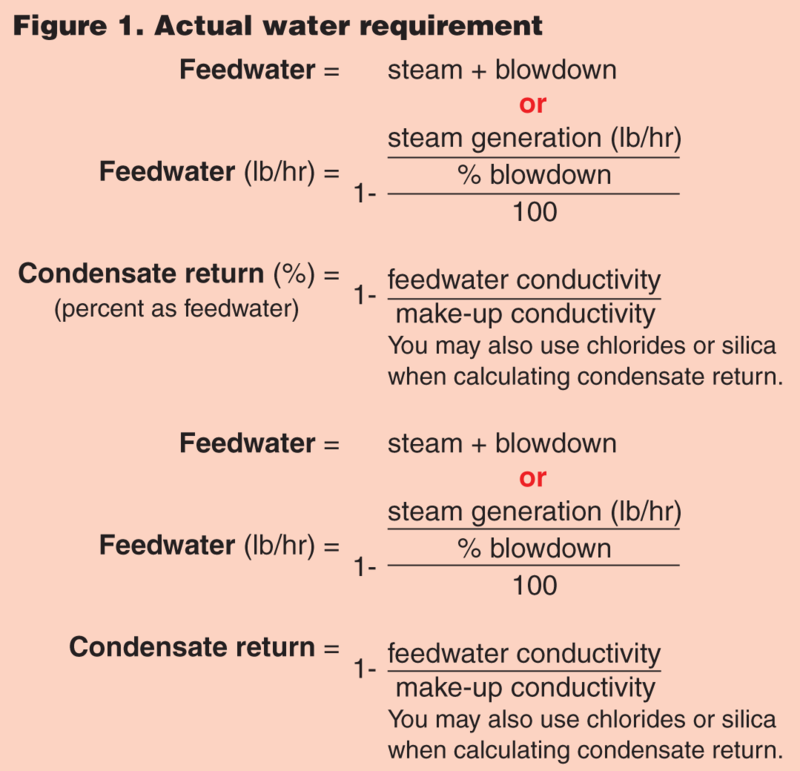 Example: If boiler conductivity = 1,000 and feedwater conductivity = 100, the boiler is achieving 10 cycles. When assessing mass balance across an entire boiler system, understanding the percentage of blowdown is critical. Control of blowdown is manual, automatic or sometimes a combination of both. 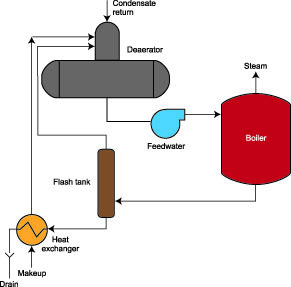 Boiler operation from plant to plant is variable. Some plant operators are very diligent with blow-down control while others are not. Regardless, the boiler blow-down percentage and blow-down rate can directly affect the overall demand on pretreatment water conditioning systems and should not be ignored. 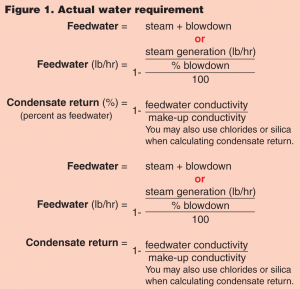 Before moving on to boiler feedwater calculations (see Figure 1), it is important to use caution when using the terms make-up (MU) and feedwater interchangeably. Boiler feedwater (FW) for industrial boilers is a combination of pretreatment make-up and condensate return (CR), (FW = CR+MU). In boilers, not all water escapes as steam. In many applications, only part of the steam exits through the process. This unused steam returns to the boiler as condensate—referred to as condensate return. For a better understanding of this, refer to Figure 2. While there are mechanical and chemical means of controlling carryover and foaming, boiler pretreatment water conditioning systems can dramatically reduce dissolved solids in the make-up. Sodium ion exchange softening and demineralizers are the most commonly used pretreatment equipment. Many industries are beginning to understand the value and added benefits of solids-reducing technologies. The implementation of newer technologies (i.e., reverse osmosis) can greatly reduce blowdown, increase boiler cycles and positively affect overall steam purity. This can reduce overall chemical treatment costs, impact total water use/reuse and protect a plant’s most valued assets. The Engineering Toolbox (2014) www.engineeringtoolbox.com/boiler-horsepower-d_1061.html. MBH Engineering Systems (2006), pH meters, pH probes, pH controllers and much more, www.mbhes.com/conductivity_measurement.htm. Lenntech (2014), Conductivity Convertor, www.lenntech.com/calculators/conductivity/tds-engels.htm. For more information, see the ASME Guideline for Boiler Operation, http://purewatergroup.com/site_english/img/tabellen/tabel2_4.pdf. Kenneth C. Willis, Sales Account Manager at Pargreen, specializes in large, integrated utility systems, treatment of cooling systems, steam systems, wastewater and process applications. Previously, he was Sales Account Manager–Heavy Industry—Steel, at GE Power and Water. Willis holds a Bachelor of Science Degree in secondary education from Ball State University, Muncie, IN. Pargreen, founded in 1966, is an industrial process, service and pretreatment equipment firm based in the greater Chicago area. They provide liquid solution to industry throughout the Midwest.